I’ve got it again–the itch, the longing, the wanderlust. It has been two years since I familiarized myself with the plane ride from Seattle to Santa Barbara (and discovered Alaska Airlines serves free wine), one year since I ate and wrote my way through Rome, and months even since I’ve driven down to my sister city, Portland. I want it back, I want to move, want to drive want to fly want to sail the seven seas. Get me out of here. Seattle, I love you, but I am bored. It’s not you, it’s me. Last week a co-worker asked me when I’m ever going to take a vacation. Thank you kindly for reminding me that as a still fresh-out-of-college kid with a pile of student loan debt and a nasty shopping habit, I cannot fly off to Hawaii twice a year like the more fortunate people I work with. But that doesn’t mean I have to be stuck. No, I don’t plan on camping (that’s a little too “rough” for me) or hitchhiking across country (that’s a little too “Kerouac” for me). But, did you know, there are dozens of cities near or around the Puget Sound? It’s funny, but for all the time I’ve lived in Seattle, my Washington excursions have been few and usually over to the other side of the state. It’s time to change that. It’s time to explore the small towns, ride the ferries, check out quirky festivals, eat a lot of seafood, and best of all, do it in a day. Over the next year, my trusty photographer/love and I will take a day trip once a month to towns 100 miles or less away from Seattle. Some I have been to before (thank you Edmonds for Anthony’s restaurant and a beach that brings back too many memories of past boys) and some I have not (where is La Conner exactly?). But with each small town excursion I want to discover what can be found in the confines of one day. 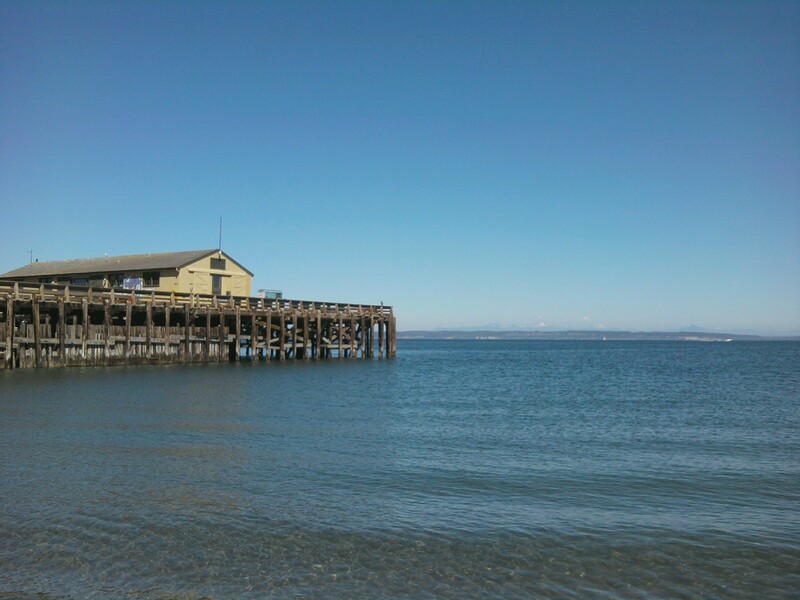 If I’ve learned anything from a day spent in Port Townsend (where my oldest friend/writing companion and I attended the Centrum Writer’s Conference), it’s that one day has the possibility to yield many adventures. In one day, Will and I missed multiple ferries, discovered a bakery/deli in Edmonds with walls lined with kitschy cookie jars, took an imaginative writing/metaphor heavy class taught by one very condescending, scrawny redhead, listened to three different writers read and lecture, waded in the Sound, filled up on beer and fish & chips, wished we could become sailors, wrote our own ghost story, and fell asleep in the ferry line. How many days in my life have I handed over to lethargy and listlessness? How many reality show marathons have I given up Saturdays too? This isn’t to say I’m done with laziness, proclaiming myself free of television. This is just to say that it’s time to get out. It’s time to leave town, burn some gas, see something new–even if it’s just for a day. I’ll keep Sundays for my day of rest.